It is long overdue. Finally the venerable Hasselblad 200 and 500 series cameras get a strap befitting their legendary stature. Two widths (20mm or 30mm) allow you to choose a strap based on your individual needs. Only the fine craftspeople of Artisan & Artist* create such a unique product that will properly fit and function with that magic box that Victor dreamed up so long ago. What is more the camera will be well dressed with plush texture straps that feature a subtle highlight in the middle. Like a racing stripe, these threads add motion without losing that undestated elegance so uniquely Hasselblad. The strap lugs are also adorned with the Artisan & Artist* asterick logo, making this the perfect marriage of two well bred brands! The washed cotton is comfortable on your neck, even in hot weather because the material breathes with your body temperature. The nylon strand core is nearly unbreakable for those worried that their camera will one day hit the deck due to a frayed camera strap. That simply won't happen with the Hasselblad Strap, one of the most durable camera suspension systems in the world! 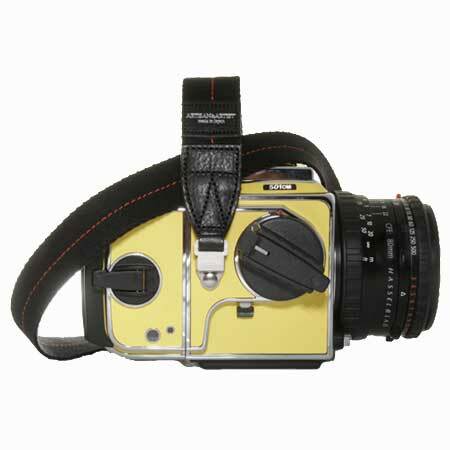 Note: This strap not compatible H Series Hasselblad.